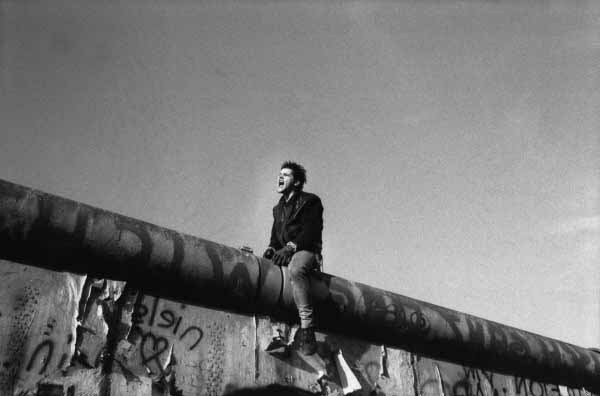 Where were you when you found out about the fall of the Berlin Wall? What is your recollection of that moment? Emotionally, it was a very special moment; it was also a moment of great hope. We saw the possibility for an opening and an end to division in Europe. I also remember it as a moment of responsibility, as a personal call. What I did not know at that moment was that the unfolding of those events would also mean the end of Yugoslavia. My mother had just died, and so had Danilo Kiš, a writer who was important for my generation. It was the end of an era. I don't know if there were any real expectations. There was a lot of uncertainty. I certainly considered it a very positive moment, because it was the end of the division of the German people and of the partition of Europe. I did not foresee all that came afterwards, the violence. Now it is easy to say that it was clear the outcome would be violent. In reality, I did not know it, and I think that few had foreseen it. I thought democratisation of some countries in Eastern Europe would ensue, with the end of regimes such as the one in East Germany. I thought that those countries would transform in such a way to more closely resemble Yugoslavia. The Yugoslav model clearly did not succeed, but we were still concentrated on the difference between theory and practice. The belief was that the reality was not good enough, but that the theory was perhaps not wrong. These were our limits, the limits of that era. In what followed, we understood that not only had the closed system of socialism collapsed, but that the Wall had collapsed on both sides. This is something that was not clear at the time. Although those events have been celebrated as a triumph of the western capitalist model, the Wall had fallen on both sides; both systems were defeated. What are the features of this defeat? We did not achieve a democratic international system; what changed were only the forms of hegemony and dominance. We are all responsible for this. Today, with the financial crisis, we see more clearly the limits of the Western model and we recognize very well the defeat. At that moment, however, this could not be seen, and perhaps, even today, it is still not sufficiently understood in the West. As if the Wall had fallen only in the East. We in the Balkans, however, realized quite early that the Wall had fallen on both sides. The end of Yugoslavia was written in the events of 1989? For a long time, we did not consider the subsequent events as part of dismantling the cold war equilibrium in Europe, of the end of division in Europe. We saw ourselves as a separate case; but, in reality, we weren't. Some things were already visible at that moment. For example, the Serb barricades in the Krajina regions of Croatia. However, when you are inside the process you are not sure what is going on. Now everybody says they knew it; I honestly didn't. I could see many difficulties, I feared tumult, but I did not really expect it. I certainly did not expect it would happen in such a rapid and violent way. Is there still a Wall that separates Eastern and Western Europe? We have started a process but I think that the Wall still exists, at least in people's minds. Division is not overcome. People certainly travel more, at least the elites. Let's say that elites know each other a bit better and there is some circulation of ideas, even though not enough. However, the problem is that divisions are ever stronger inside Europe; these divisions are racism, economic and class problems, social problems and migration. In many countries of Eastern Europe, dissidents are in power, or they were in power in the past. What happened to Yugoslav civil society from the socialist period? Yes. Tragic... European mediators never talked to members of the non-nationalist civil society in Yugoslavia. Did Europe become stronger or weaker after 1989? Europe had there a historic opportunity to become stronger, but did not use it. The time for strong European presence at international level has obviously still not come. However, at this stage, I wonder if it is necessary and what hope it could possibly bring. The problem is that Europe did not assume its responsibility in events that go well beyond the crises of the 1990s. Responsibility related to World War II, the extermination and consequent expulsion of Jews and the creation of Israel, which is a colonial creation. The conflict in Palestine is continuing and I do not see Europe acting intelligently in this situation. This happens because in Europe we are all, not just the German people, guilty of what happened to the Jews. However, the memory of all of this is distorted; it resembles an oblivion, forgetting the Palestinians in favour of Israelis. The other great oversight concerns Europe's colonial history. Colonialism ended in the 1960s; but, at present, its consequences are felt in the strong migratory processes, and Europe does not acknowledge its responsibility. Europe closes the doors; it is enough to see what is going on in the Italian island of Lampedusa these days. The third oversight concerns the use of violence to construct Europe through wars on its periphery, such as those in ex-Yugoslavia in the 1990s, and those with lesser intensity that continue in the Caucasus and Russia. Europe is being constructed on this oblivion. What is the relation between these elements? It is not a linear process, from the point of view of time. Migration, colonialism, and the wars in the Balkans add up with a paradoxical contemporaneity. That is, they are not contemporaneous elements, but they become such in the process of European construction, by how Europe removes problems without solving them. It circumscribes them, boxes them up, it creates partitions without thinking of the whole. How should we remember 1989? There are events of that particular year which were even more important than what happened in Europe. The violence on Tiananmen Square happened in 1989; that year China changed radically into the form of socialist capitalism - I don't know how to define it - a specific form of neoliberalism. The same thing happened in India. In that country also 1989 was the year of transformation, of a great opening to the market, of the end of the socialist project. Internal divisions started to emerge in a radical manner in these two countries in that particular year; the growing poverty of one part of the population, against growing enrichment of another. Europe emulated, to a lesser extent, the division that ended. In that particular year in India and China, similarly to the countries of Eastern Europe, all the programs of the welfare state were abandoned; in Western Europen also welfare started being attacked. Globalisation started becoming visible. The memory of communism turned into cheap merchandise, badges, and red stars sold on the streets. Is there something from this period of time we should remember? Many things should be remembered, but a problem emerged; that of the transfer to another form of language and of the loss of sense. We entered a process of desemanticisation of what we had before. Everything has been turned upside down. This process of losing direction and orientation has also provoked a loss of political passion, and a loss of judgment. And this process has stimulated the loss of memory: what do you want to remember when you remember decline or the "other side"? We are facing a greater problem, a theoretical problem that concerns language and paradigms in general. We need an epistemological revolution in political rhetoric and thought; not only inside Europe but also in countries in the South, and formerly colonized continents. I believe that some ideas will come from the South and, also, from the East, from the non-hegemonic part of the planet. From this point of view, the East is in the South.